Our experienced consultants can tailor their delivery of the 5 Choices process to precisely meet the needs of your organization. The program can be facilitated in the traditional live classroom method, through live online webinars, or in a blended delivery of both classroom and webinar learning. Traditional Classroom: A FranklinCovey Facilitator can deliver The 5 Choices content in a traditional classroom setting within your organization. LiveClicks Webinar Series: All of your employees can experience The 5 Choices no matter where they live and work around globe. One of our experienced facilitators can deliver our 5 Choices content virtually to your team via our LiveClicksTM platform. Participants will enjoy an array of videos, graphics, polls, chats and interactive exercise for a rich online learning experience. Blended Delivery Solution: Our new blended delivery solution is the first of its kind to be offered by FranklinCovey. Our facilitator(s) can deliver a mixed format to include both traditional classroom and webinar-based learning. 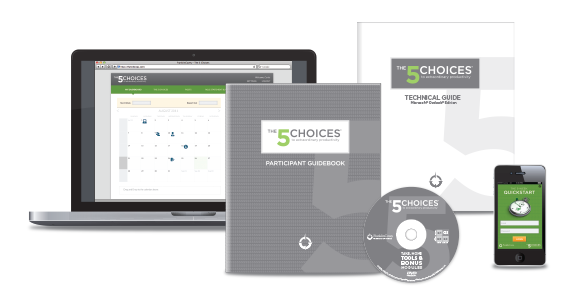 For example, clients might choose to have delivered the first day (Choices 1 – 3) in the live classroom, and the second day (Choices 4 – 5) as webinars. Please send me communications from FranklinCovey’s Productivity Practice in the future.